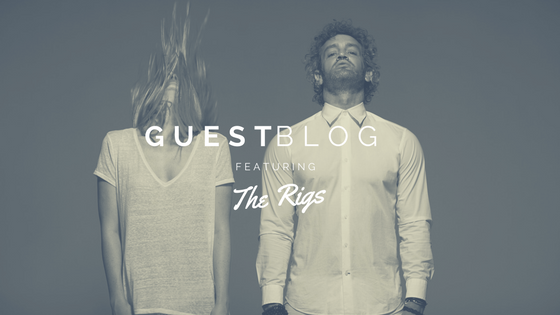 Caitlin Parrott and TJ Stafford have been working together as The Rigs since 2014, and have shared moments together that have been both rewarding and challenging. In this guest blog, they chronicle each year they’ve worked together with some of their most memorable moments. CP: For me the most memorable thing about 2014 was just that we started writing together. For as many years as TJ and I had known each other and played music together, we have never written. And honestly, the first time we did just felt like fire. Suddenly everything made sense. All of our history, the tension...it was like it all just suddenly had a place and a purpose. TS: For me it had to have been our first writing session. I had never written with someone that I'd had such a complex history with, and going into it in such an emotionally transparent way was a transformative experience. CP: Definitely one of my favorite memories (maybe ever) was playing the Troubadour in July of 2015. It was the first show we ever played as The Rigs and we played to a sold out room. I remember we had friends calling before the show saying they couldn’t get tickets, and TJ and I were like, “we did it!” That was the most nervous I’ve ever felt for a show and the most fulfilled I have felt after one. It felt like the beginning of something really special. And it was. TS: The entire year was memorable in that it solidified our relationship both personally and professionally. I would point to that as the year we truly became best friends, and the year our work together musically became serious and focused. It was interesting to see those two things coincide and one not diminish from the other. CP: In 2016, TJ and I were asked by Sony to come to New York for a special showcase. We ended up playing an acoustic set for an exclusive group of a couple hundred people on the roof of the Sony building as the sun was setting. It was truly one of the more magical and romantic experiences of my life. CP: Releasing our new album!! I think we just had so much more clarity with this latest project and more direction. I am SO proud of the first 3 albums we released. But everything happened so fast, it felt like we were always kind of playing catch up. But with this recent project, we really had the time to give it the attention it deserved. I think releasing the couple videos we released was my favorite highlight. TS: The new album, for sure. It's a great album and I'm extremely proud of it. Not only the finished product, but the struggle of getting to those new sounds, the fights that occurred when one of us thought the new sounds went too far, working through those, and allowing each other to contribute and shine individually. I think this album highlights not only us as a duo, but allows each of our personalities and songwriting styles to flourish without diminishing the whole.